Old school simplicity. 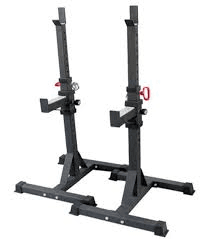 These compact and easily portable squat stands are perfect for jerks and squats when space is limited. • Safety spotters on each post can be adjusted accordingly. • Range of 36" to 62"